I almost love gingham as much as I love stripes. It's such a fun print that I always associate with summer. This season gingham is cropping up on just about everything from blazers to shoes to bags, and I want everything. 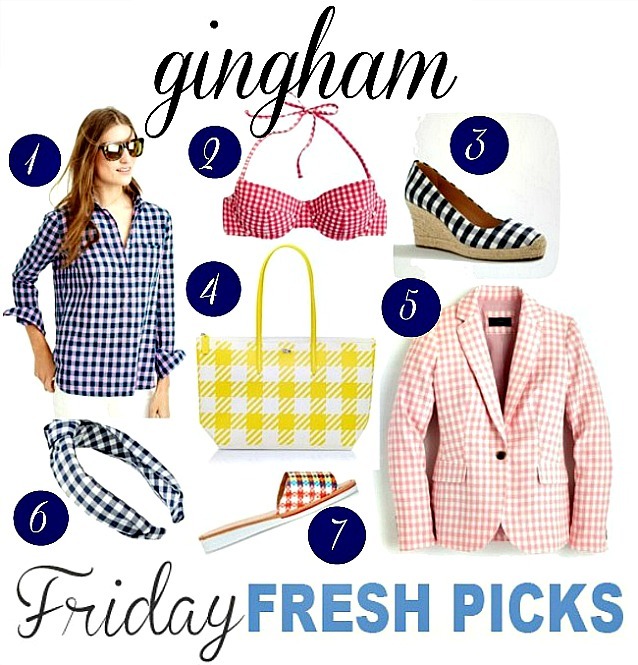 For work or for weekends, gingham is so fresh and a welcome change from solid colors. In today's Friday Fresh Picks, I'm sharing a few of the things on my summer wardrobe wish list, and guess what? They all happen to be gingham! 1. Gingham shirt - If you choose to buy one gingham item, it should be a shirt. They pair perfectly with shorts, destructed denim, and white jeans. 2. Gingham bathing suit - Talk about channeling the 1950s. I am obsessed with retro bathing suits right now. Definitely thinking about this one from J. Crew for this summer. 3. Gingham wedges - If you are on the fence about wearing a bold pattern such as gingham, try it on an accessory such as a shoe. This wedge heel is super cute and works with jeans, flares, and skirts. 4. Gingham tote bag - A large tote is a must for summer and this one will take you from the beach to the farmers' market to dinner. 5. Gingham blazer - I've been having a love affair with blazers lately. A white one from Banana Republic has been my go-to for months now. But this gingham blazer is a nice change of pace and perfect for spring. 6. Gingham headband - Much of my summer is spent with my hair pulled back. This headband amps up a ponytail and keeps your hair out of your face. 7. Gingham slide - This casual shoe will be right at home at the pool, beach, or on easy going weekends.